The time for the season of hope and renewal couldn’t come fast enough around the Northeast after the ravages of Hurricane Sandy. So it is time to survey the regional music and dance scene for seasonal performances that will put you in the Christmas spirit. It’s a good time to get out of the house and share with family and friends some joyous noel music, especially if you like trad music at any time of the year. It has become such a classic Yuletide tradition in New England that it is hard to believe that the Christmas Celtic Sojourn is only celebrating its 10th year this December. Cleverly produced each year by music director Seamus Egan, theatrical producer Paula Plum and originator Brian O’Donovan who hosts a weekly Celtic music program on WGBH in Boston called Celtic Sojourn (www.wgbh.org), it is worth the road trip to catch one of the shows at six different venues up there. The cast fluctuates from year to year but it is always sterling and drawn from the “Celtic roots and branches” as the affable Corkman O’Donovan likes to refer to his weekly mix of Celtic folk music. Solas form the heart of the musical troupe organized for this anniversary year, plus the popular return of Chris Stout and Caitriona McKay from Scotland, the Midwest a cappella harmony group Navan, and for the first time Scots singer Alyth McCormack along with dancers Nathan and Jon Pilatzke and Cara Butler. McCormack, the Pilatzkes and Butler all regularly tour with the Chieftains. The young dancers from the Harney Academy of Dance will also be on hand. There are 11 performances slated with six at the Cutler Majestic Theatre at Emerson College in Boston’s Theatrical District (December 16, 20, 21, 22 with double shows on 16 and 22). Other venues are in Derry, New Hampshire (15th), Rockport, Massachusetts (17th), Worcester, Massachusetts (18th) and Providence, Rhode Island (19th) with a special appearance of dancer Kevin Doyle from Rhode Island. Visit wgbh.org/listen/achristmasceltic_sojourn2011.cfm. For five years now Dr. Mick Moloney has been leading a band of merry minstrels at his favorite Big Apple performance space, the Irish Arts Center, for An Irish Christmas: A Musical Solstice Celebration. Each year they keep adding shows to deal with both its popularity and also the small but intimate Donaghy Theatre. In that time it has also grown in sophistication and diversity with other cultures resident in New York’s melting pot milieu mixed in for some added spice. Last year the center produced a CD featuring live performances from the 2010 season which captured those aspects as well as the talented ensembles orchestrated by Moloney. This year’s batch of 16 shows will be highlighted by a special outreach radio taping of An Irish Christmas at a live show on the Fordham University campus (Fordham Preparatory School) on Sunday, December 9 at 3 p.m. Organized by James Houlihan, a Fordham alumnus, the show is a fundraiser for center’s capital program for a new center, and the show will be broadcast on WFUV on the 16th and 22nd. Seats are $35 for the basic show, but a limited number of VIP seats at $250 are available that include priority seating, a cocktail reception and supper afterwards. (We’ll have more info next week on the radio show and guest artists appearing this year). Full details are available at www.irishartscenter.org. One of the most popular of the Christmas variety shows is the Cherish the Ladies road show featuring 14 shows from the Midwest to the Northeast. Joining Cherish the Ladies (Joanie Madden, Mary Coogan, Mirella Murray, Kathleen Boyle and Grainne Murphy) again this year is the mighty singer from Headford, Co. Galway, Don Stiffe. You can count on the usual flying feet dancers made famous by CTL over the years. No one does a better job of integrating traditional Irish music gracefully in with Christmas carols than this group as they have proven over the years and in two Christmas albums. After touring around the Midwest for the first two weeks, Cherish the Ladies will be open their East Coast swing at the Tarrytown Music Hall on Friday, December 14 followed by the 15th at the acoustically awesome Troy Savings Bank Music Hall in Troy, New York. Both venues are historic and offer good sightlines and sound. There is a brief foray down to Philadelphia at the prestigious Annenburg Performing Arts Center (UPenn) on the 16th. 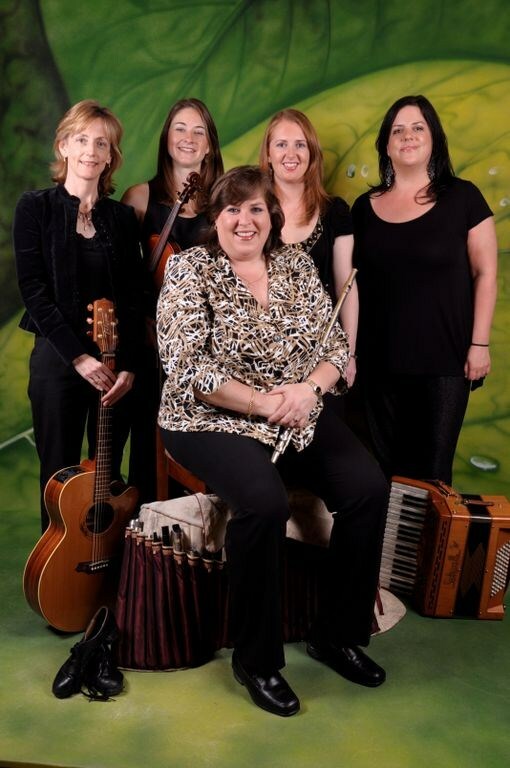 Joanie and the girls finish their tour on the 21st at the Towne Crier Café in Pawling (www.townecrier.com) and finally on the 23rd at the Mineola Irish American Center. Visit www.cherishtheladies.com. If you are stuck for a gift for that special someone on your list or looking for a way to beat the winter blues, you might want to take a look at www.joaniemaddencruise.com for info about her folk and Irish cruise to the Western Caribbean aboard the Norwegian EPIC taking place February 2-9 out of Miami Beach. With over 50 fabulous entertainers it will be quite the nautical adventure. Oisin Mac Diarmada and Teada are regular revelers at this time of the year with his popular Irish Christmas in America tour. They start in the Midwest also and the Southwest (to warm up) before hitting the Northeast. Oisin has the irrepressible Seamus Begley and Sean McElwain, his Teada mates, on board this year with guest artists Aaron Jones (from the Scottish group Old Blind Dogs), harpist Grainne Hambly, Sean Galvin and sean nos dancer supreme, Brian Cunningham from Connemara. Their stops include once again the Strand Theatre in Lakewood, New Jersey on Friday the 14th, two shows on the 15th at the National Geographic Society in Washington, D.C. and Sunday the 16th at the Sellersville Theatre in Pennsylvania. Eileen Ivers’ An Nollaig Christmas Show will make an appearance in Northern New Jersey for two shows on December 9 at 3 and 7 p.m. at the Berrie Centre at Ramapo College in Mahwah. For info on tickets contact 201-684-7844 or www.ramapo.edu/berriecenter. On Saturday the 15th at 7 p.m. (doors open at 6 p.m.) the GIRSA girls are putting on a Christmas show at the Pearl River High School (275 E. Central Avenue). It’s always great to see them in their home town and the multi-generational fan base their concerts attract. They will have a number of special guests on hand, including former Riverdancer Chris Naish and MC Fergal Hayes. Call Peter McShane at 917-560-7647 or Maeve Flanagan at 845-323-7539 or visit girsamusic.com. Tickets can be purchased in advance in Pearl River (Danu), Westwood, New Jersey (Irish Eyes Gift Shop), White Plains (Brazen Fox). Part of the proceeds will be donated to Hurricane Sandy relief efforts. Finally, the Irish group Danu is over on their Christmas tour without a stop in the New York City area save for a free lunchtime gig (1-2 p.m.) on the 11th at the Winter Garden, appropriately enough in the World Financial Center across from Ground Zero and the Famine Memorial. If you are working around that area you couldn’t find a better way to spend an hour than listening to what is still one of the tastiest of the Irish trad bands. One of Ireland’s foremost contemporary composers, Phil Coulter of Derry, will be in residence from November 29 until December 30 at the Irish Repertory Theatre in New York. The Rep is known as one of the great places to see live theater in Manhattan and is also a wonderfully intimate place to see and hear music, especially with a musician of Coulter’s caliber. It’s also a wonderful chance to hear Coulter talk about his music and the genesis before many of our most familiar songs. Visit www.irishrep.org. A final reminder that there is a dedicated night of music dubbed the Sandy Seisiun by Irish musicians this Saturday, December 1 at Connolly’s Klub 45 off of Times Square starting around 5 p.m. to raise funds for those who were hit hard by Hurricane Sandy. Lots of wonderful musicians have donated their time and talents for the cause including Jameson’s Revenge, Mickey Finns, Celtic Cross, GIRSA, Broken Banjo Strings, Lost Tribe of Donegal and a few special guests along the way. Connolly’s is at 121 West 45th Street between Times Square and Sixth Avenue (www.connollyspubandrestaurant.com).